The Well Fed Network has announced the winner of the 2005 award for best food weblog covering the food industry. Congratulations to the entertaining food weblog, The Food Whore. -- U.S. Food Policy (this weblog). Visit all five finalists. They are eye-popping gorgeous. Vegetarians and non-vegetarians alike may find the Vegan Lunch Box inspiring. I enjoyed following links from that page (hear, for example, the sincere podcast Erik's Diner). 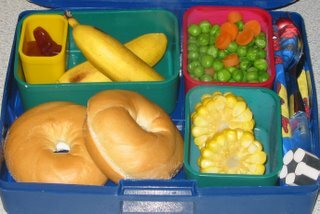 The Vegan Lunch Box posts almost daily pictures of the wonderful lunch that the author's "little shmoo" carries to school. Can you handle knowledge about GMOs? What is this school selling?